I was curled up on the couch, a fire in the fireplace, book in hand, trying to shake off the post-Christmas lethargy caused by a big meal and too many cookies when the doorbell rang. Mittens jumped down immediately and scampered toward the door. I wondered who it could be? I wasn’t expecting company. I pulled open the door to find Greg on the front step, bundled to his eyebrows against the cold that had turned his cheeks and the tip of his nose red. “I thought you might like to go for a walk,” he said as I let him inside. Lazy snowflakes drifted from the sky, and the ground was already covered with half a foot of powder. Greg and I walked past the cranberry bogs, now dormant under their coating of ice, and headed across an open field. Suddenly Greg let go of my arm, bent and scooped up a handful of snow. He formed it into a perfect ball, stepped back and lobbed it at me. “The fight is on,” I said, grabbing a handful of snow myself. I hit Greg square in the chest. He retaliated with another snowball and we continued until both of us collapsed, laughing, in a pile of snow. “Sounds good to me.” Greg held out a hand and helped me up. The snow was coming down harder and heavy clouds filled the sky. When we got back to my cottage, I lit the tree, the candles in the window and turned on some Christmas music. Greg grabbed me by the hand and began dancing me around the room. I giggled as he twirled me around and around. I laughed. “Definitely.” And I tightened my arm around his neck and held my lips up for a kiss. Happy New Year from all the characters at Sassamanash Farm! The first book in the series, Berried Secrets (Berry the Hatchet comes out in May) is now an audio book! Available at Amazon, Barnes & Noble and Tantor.com. The fourth book in my Lucille series is now out! 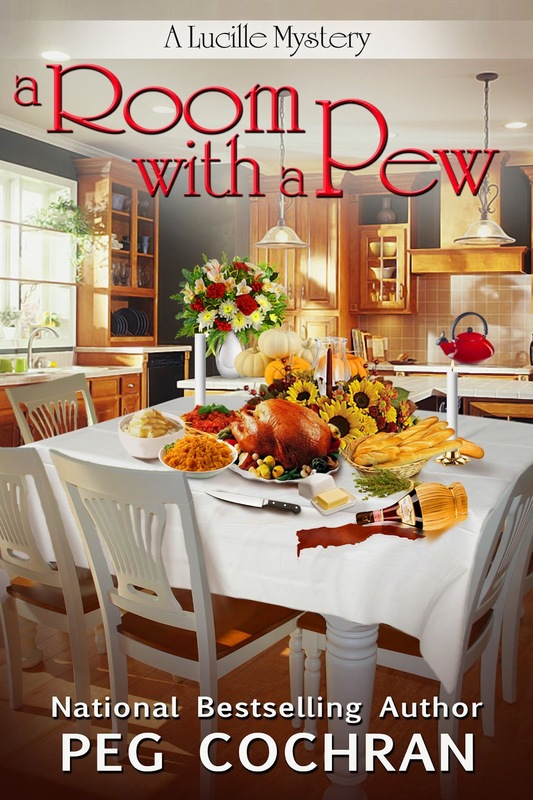 A Room with a Pew is available wherever ebooks are sold. Lucille Mazzarella is back, and this time she’s investigating the murder of her own poor cousin Louis. Tracking down a killer might lead the fifty-something housewife into the clutches of a Godfather she never wanted to meet. 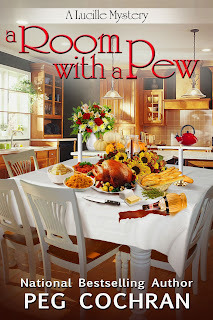 When Lucille discovers the body of her cousin Louis in the church parking lot, her first thought is that he may have skipped one service too many, but when the cops shock her with the news that Louis was killed by a professional hit man, she realizes the Almighty had nothing to do with the deed. Even more shocking is the discovery that the victim, who never had a penny to his name, had socked away a huge wad of cash. As Lucille and her best friend Flo follow the money trail, it leads them from a seedy strip joint to a high-stakes gambling ring and all the way to the mob. As the thugs close in and threaten to end Lucille’s detecting days for good, she’s tempted to give in to the most dangerous crooks she’s ever faced, but then she remembers she’s got a little family thing of her own that means more. I am enjoying Berried Secrets right now! Stepmom sure is a hoot! Merry Christmas! Glad you're enjoying it! And Merry Christmas to you, too! I haven't read this one, but enjoyed Berried Secrets. Will have to get this one!!! I am not familiar with the Lucille series but it sounds like a good series to read when you want a good mystery and some laughs. I know I have a Lucy book on my iPad. After reading the summary here, I think I should read it next. Berried Secrets was a great read. Looking forward to the next one. I wish I could have a snowball fight with a certain gentleman...but this year I don't even have snow yet! I haven't read the Cranberry Cove series yet but they sound good! This sound like a good cozy for me to read . I like the ones that are humorous too.